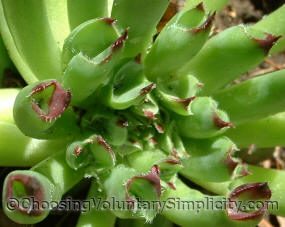 Oddity is usually classified as a large sempervivum and a mature rosette can have an astounding number of tubular leaves. I have counted as many as seventy-five tubes on one rosette. 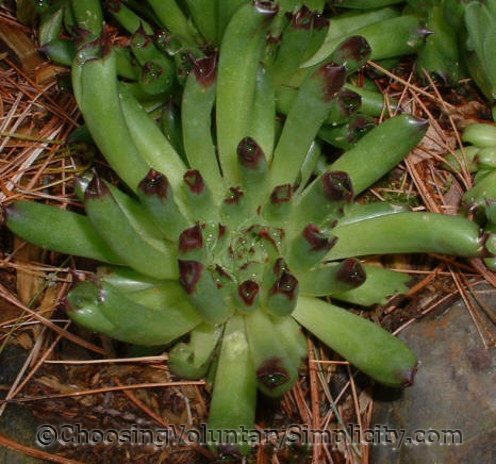 Oddity leaves are thick with sharp points and they curl lengthwise and backwards to form the individual tubes. 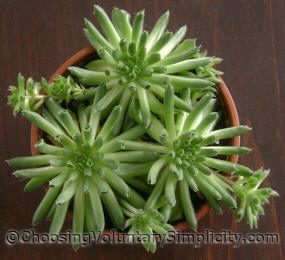 I think all my sempervivums are wonderful, but one of my very special favorites is Oddity. When the deer decimated my sempervivum gardens last winter, I felt especially sad to have lost so many Oddities. For many, many years they have been a unique part of my gardens with their colorful rosettes of long hollow red-tipped tubes. 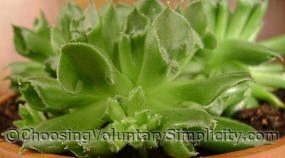 In my experience Oddities are much slower to bloom than many other sempervivums and it is not unusual for a rosette to grow and produce chicks for many, many years without producing any flowers at all. Oddity thrives in our zone 4 temperatures without any winter protection, but I have found that it does not grow equally well in all locations. 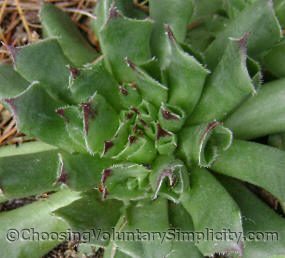 It is definitely one of the more “picky” sempervivums. New chicks are formed on lateral runners. They look somewhat fragile and delicate and their tiny tubes start out hollow and completely fused together. As chicks form on a runner, I check to make sure that the bottoms of the new rosettes are in contact with the soil and that the chicks aren’t being crowded out by the more mature rosettes, but I leave the new chicks attached to the runners until they have formed a good set of roots. This tiny chick already has good roots even though it is still less than an inch across. This photograph was taken in May and the temperatures were still quite cool. The little chick is starting to get some red coloration on the tips of its tubes. This is the same chick in late September. The chick has almost doubled in size and its rounded tubes are thickening and becoming much broader. Many of the tubes are changing to become almost flat with a visible “seam”… or in some tubes an actual opening… running down the back side of the tube. I have read that some Oddities mutate to flat-bladed rosettes and don’t have tubes. I wonder if these plants are simply being observed in the flat-bladed stage of their growth at a particular time of year… or if they are growing in stressful conditions. I have to admit that in all the years I have grown Oddities, I never noticed that the leaves change from tubes to blades and back again until my recent efforts to save my Oddities. For a while I thought that the new Oddities I had purchased were the type I had read about that mutated to flat blades. I have since discovered that the same plant and the same leaves can look completely different at different times… and photographs show that the same completely fused tubes with no seam become flattening blades with a visible seam and then open to become completely flat blades… and then back again to completely fused tubes with no sign of a seam. This fall I brought three tiny Oddity chicks inside for the winter and planted all three of them in a four-inch terra cotta pot. Each chick measured slightly more than an inch but less than two inches across, and at the time I brought them inside each chick had a combination of some completely fused and closed tubes and some leaves that were just starting to flatten out to become open blades. The leaves had also become a slightly darker green. This photograph was taken after a few weeks of lights and warmer temperatures and shows leaves that were beginning to become more tubular again. Did the leaves broaden because of the colder temperatures and the approaching winter weather? The three Oddity chicks were outside until late November and the morning of what looked to be the first lasting snowfall. 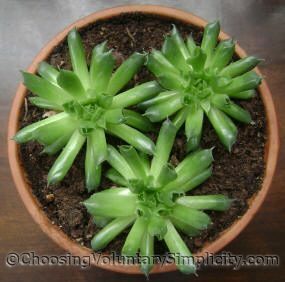 I let them acclimate to the warmer inside temperatures and grow lights over a period of several weeks, and after a while it was obvious that the little chicks had started to grow again. The flattened blades were also becoming more tubular. By mid-February several even smaller chicks had begun to form around the little rosettes. The one rosette that was the last to produce chicks was also the last one to reform tubular leaves. Six weeks later all three of the original rosettes have tightly fused tubes. There is no sign of a seam or opening on the underside of any of the tubes, and the tubes are all longer and thinner than they were just a few weeks ago. The older chicks have also changed slightly in their overall color and are now the same slightly lighter shade of green as the newer chicks. Are the warmer temperatures and bright grow lights making the chicks anticipate spring? They definitely will need a bigger space when I move everybody outside again for the summer. With the three original chicks and the seven new chicks there isn’t much room left in that four-inch terra cotta pot! Oooh! I want one. Love Oddities and am just about ready to those gardens started. Very informative post. Thank you for sharing. Is there any chance that you will be doing posts on the other types of semperivums you have? I’m really interested in the different varieties and information per se. Thank you so much. I just wanted to thank you for the wonderful information you share. Your first hand experiences are extremely interesting. This is the type of info one can never find in books. 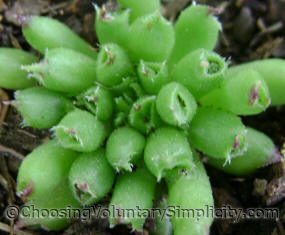 Well you have answered a question I had about these sempervivums. I have oddities too (altho I didn’t know the name until I read your article) but some of the time their leaves look like tubes and some of the time their leaves are flat. I thought there was something weird about my plants but after reading your article I understand it now. Thanks for the great pics too, very beautiful! These are beautiful photos and great information too. I always look forward to your gardening posts. A special thank-you for a realy wonderful blog!